A few old projects inspired by great recipes from some of my go-to blogs. Salted Butter Caramels: David Lebovitz, former pastry chef at Berkeley’s legendary Chez Panisse, now living in Paris, is a great source for sweet and savory recipes, as well as affable observations from an American living in France. His recipes (and insights) tend to be spot-on, and I really enjoy his easy-going and humorous approach to quality cooking. Check out his simple recipe for making wonderful salted butter caramels at http://www.davidlebovitz.com/2010/01/salted-butter-caramels/. I used this recipe to make rosemary infused salted butter caramel lollipops to give as holiday gifts – just heat a bit of fresh rosemary in the heavy cream then strain before using it to make the caramels. 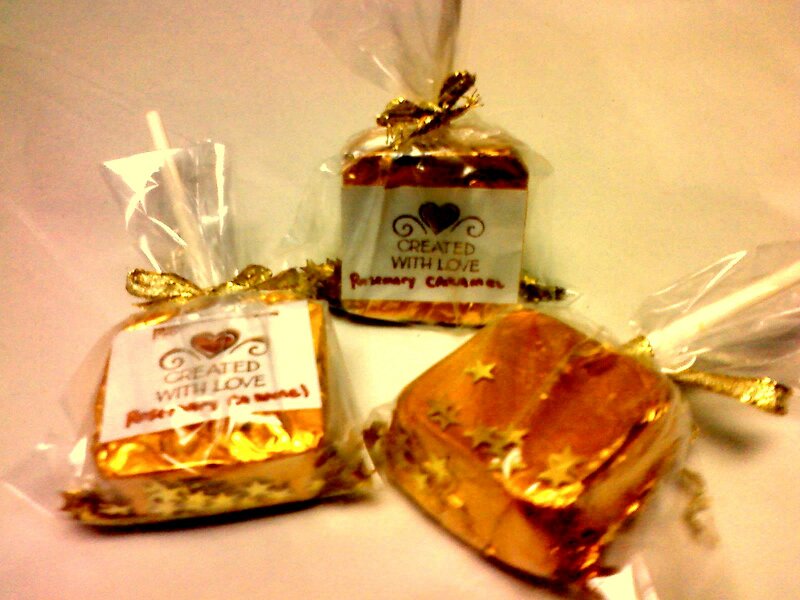 The hot caramel was poured into a silicone lollipop form and the resulting treats were wrapped in foil and gift bags (all available in the baking section of the craft store). As with any recipe that emphasizes a few simple ingredients, this is worth using quality butter and salt for the best flavor and most bang for your time in the kitchen. A few other favorite recipes from David’s blog are French vinaigrette (easy! delicious!) http://www.davidlebovitz.com/2009/11/how-to-make-french-vinaigrette/ and apricot jam, which I make in the summer when apricots are cheap and plentiful http://www.davidlebovitz.com/2009/08/apricot-jam/. I like to throw in a handful of dried food-grade lavender as well as a few apricot kernels – it makes a delicious, herby, tart jam that can be combined with equal parts Dijon mustard for a great chicken or pork marinade, spooned over goat cheese and served with crackers, or spread as a jam layer on a layer cake to seal in the crumbs before you frost. Or, you know, just spread on toast or eaten out of the jar with a spoon (but I say when in doubt, eat with cheese). 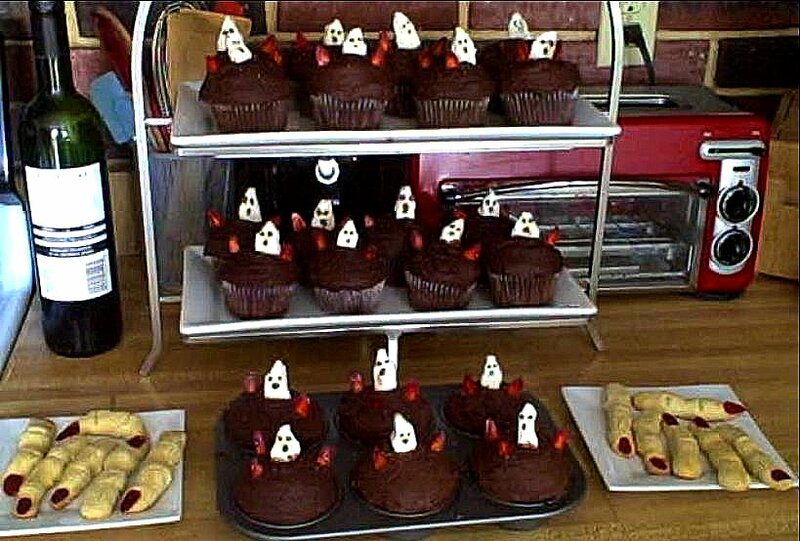 Halloween: Martha Stewart always has such great Halloween recipes on her site. Unfortunately, it seems like they’re often over complicated or look much better than they taste, which just doesn’t work for me. This recipe for “Lady Fingers” on the other hand, is fast, looks creepy, and – best of all – is fun to make! I tinted half the dough with green food coloring and used black food coloring (available at the craft store around Halloween) for the nails to make a batch of troll toes to go with my lady fingers. Full disclosure – I did have a few guests that thought they were too creepy to eat. However, I lack patience for the stick-in-the-mud sort, especially if they are the type to turn down cookies (because…COOKIES!). Original recipe and article at http://www.marthastewart.com/recipe/ladies-fingers-are-easy.